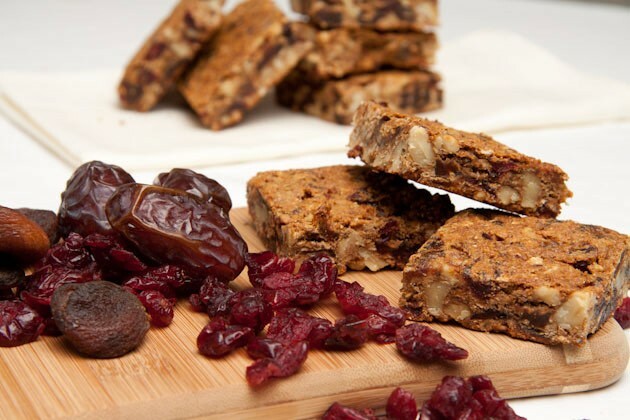 Vegan and grain-free bars made with chickpea flour, dried fruit and nuts. Preheat oven to 350F. Line an 8×8 pan with parchment paper across both sides for easy lifting. Then, line a baking sheet with parchment or a silicon baking mat. Scatter chopped walnuts on baking mat and toast in the oven for 8-10 minutes [mine took 10]. Remove from oven and set aside. Meanwhile, place apple and prunes in a small saucepan, cover with water and bring to a simmer. Allow to cook for 5 minutes. Drain and puree with maple syrup in a food processor or blender until smooth. Set aside. In a large bowl, whisk together chickpea flour, protein powder, quinoa flakes, flaxseed, baking soda, cinnamon, and salt. Sit in the walnuts and dried fruit. 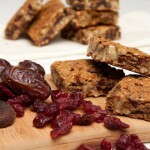 Make sure the nuts and dried fruit are completely coated with the flour mixture. Remove from the pan and allow to cool for 20 minutes before slicing with a sharp knife.